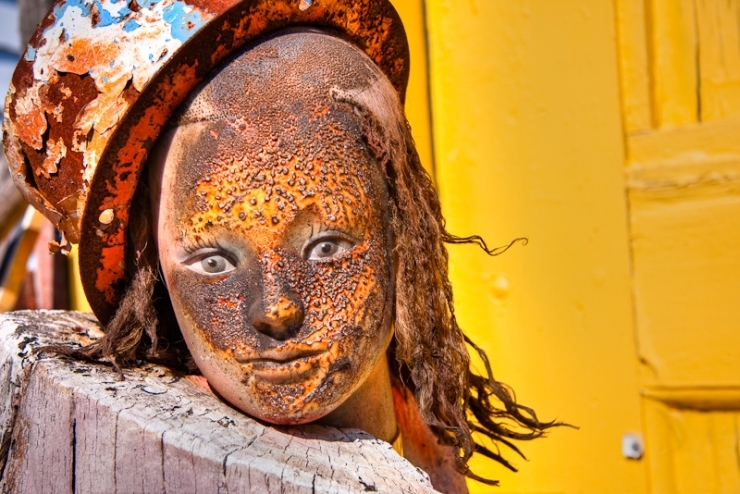 A photo from The Heidelberg Project. The title I have given this photo is Face Today. Like I have said before this place is something you have to see when you visit Detroit. Some people wonder why? Some people love it. Me I enjoy it every time I go. I just let my imagination go. Sometimes that is the best thing to do just let your mind go from the day to day life we all live. Face today this moment and see things. Not the logical view, not what it actually is, what you think, what you feel, what? Ok here is what I see in this photo of mine. I see color yellow, bright, warm, light, feel good, freedom. I see beauty in a face that has worked so hard to entertain you and everyone around. That played the role of being perfect. Now done and burnt still with the need to show the world she can still go on. Burnt and disfigured but still so beautiful. Time to rest in the bright, warm, light. Now that I shared with you feel free to share with me your thoughts and imagination on my work. Share what you enjoy about the location I shoot in if your familiar with it. The mind is a terrible thing to wast, but yet most of us let it wast. So open up its alright to be crazy. The norm in society can be so boring at times. Go visit the website http://www.heidelberg.org/ that way you can see what The Heidelberg Project has to offer.